Does your office use one-time-use paper towels? Why not switch to washable cotton hand towels. Do you have a water fountain with disposable cups? Why not get employees reusable BPA free cups for their desks. Our actions are cumulative: together we created this mess, so we must fix it together too – both by changing our behaviour as individuals and by demanding change from corporations and government. 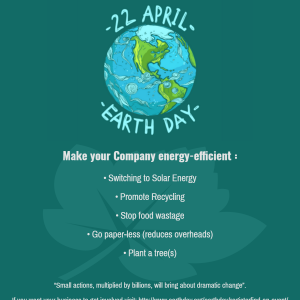 One way we draw attention to these issues is by celebrating Earth Day on 22 April.